North American Sartre Society CFP out now! Fellow Sartreans and friends, the North American Sartre Society (NASS), have announced the call for papers for their 4-6 November meeting. The conference will be held at University North Carolina Wilmington (UNCW) and the theme is “Existentialism and Engagement: The History and Future of Existentialism.” The conference’s keynote speaker will be Sarah Bakewell. We invite proposals which address the legacy and future of existentialism and politics, reflecting on the history of existentialism in the public sphere, including its role in art, journalism, theater, social movements, music, the academy, and electoral politics. We also encourage participants to address questions such as: What is the future of Sartre scholarship? Will existentialism have a home outside of the academy? As always, we also welcome papers in any area of Sartre scholarship (philosophy, literature, theater, psychology, politics, intellectual history, Sartre and other writers, etc.) Proposals need not address the conference theme. The North American Sartre Society encourages diverse and pluralistic approaches to Sartre Studies. Reading time for a paper should be 20-25 minutes maximum. In addition to individual papers, we welcome suggestions for panel topics. Proposals may be submitted in either English or French. Graduate students are also encouraged to submit proposals. We hope to provide a limited number of stipends for graduate students to help defray the costs of travel and lodging. In order to be considered for a stipend, graduate students must contact us to apply. All those whose papers are accepted are required to become members of the North American Sartre Society (if they are not already) in order to present a paper at the conference. DEADLINE FOR SUBMISSION OF ABSTRACTS: July 31, 2016. Please E-MAIL an abstract (1-2 pages) as an attachment to Elizabeth Butterfield: ebutterfield[at]georgiasouthern.edu. This is a great conference and opportunity so don’t delay… submit your abstract today! Photos: NASS 2015 at East Stroudsburg University, Bethlehem, PA by Beck Pitt and licensed under CC BY 2.0. We were inundated with excellent submissions for this year’s conference and would like to extend a big thank you to everyone who submitted an abstract. We’re now pleased to announce the line-up for this year’s conference Existentialism and the Body which will take place on Friday 1 July 2016 at St Peter’s College, Oxford. Spaces are limited … so please register to participate and guarantee your place. We look forward to seeing you in a couple of months! Existentialism, Race and Gender conference: Session Videos Out Now! Missed Friday’s conference? Were there but wishing you could hear a talk again? Could only come to part of the conference and didn’t catch all the sessions? Well, don’t worry, we’re pleased to announce that ALL session recordings are now available on YouTube for your viewing/listening pleasure! Existentialism, Race and Gender: Thank you! A massive thanks to everyone who made it to London for our conference on Existentialism, Race and Gender on Friday at UCL (and a big shout out if you participated in the Rethinking Existentialism workshop on Fanon yesterday too!) We hope you enjoyed the past few days as much as we all did! We had a fantastic selection of speakers and talks. But don’t worry if you weren’t able to make it, or could only come for part of the day. We recorded all of Friday’s sessions and the afternoon sessions of the Fanon workshop. These will be made available shortly. In the meantime, all feedback welcome and if you blogged about either conference or have photos etc. you’d like to share, we’d love to hear from you. Thanks again for participating and see you next year! The conference will be followed on Saturday 19 September by a one-day workshop on Frantz Fanon, somewhere in London, organised by the AHRC project Rethinking Existentialism. More details, including registration information, to follow shortly. We look forward to seeing you all in September! Bad Faith and Antiblack Racism, and editor of Existence in Black. Catch Up on Our Conference Sessions! Didn’t manage to make it to last year’s conference? Enjoy a particular session but wish you could hear it again? Never fear, you can now revisit our 2013 and 2014 conference with today’s release of eight recordings! We are aiming to record future conference sessions so will be adding to our YouTube channel playlist intermittently. The recordings are all openly licensed (CC-BY 4.0) and available for reuse with appropriate attribution. You can find out more about Creative Commons licensing here. Thanks to all the speakers for agreeing to have their sessions recorded. We hope you enjoy listening and watching the recordings and if you have feedback, we’d love to hear from you! 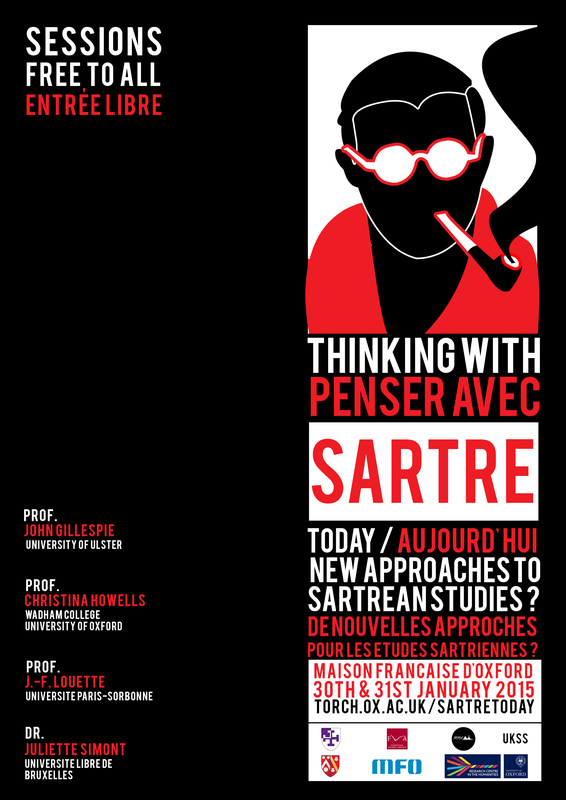 Thinking with Sartre Today: Programme Now Available! With just over a week to go the Thinking with Sartre Today… conference is pleased to announce that the full itinerary is now available! You can download a copy here. With speakers from around the world and keynotes including Prof Christina Howells (University of Oxford) on “The Ethics of Aesthetics: Sartre and the Subject of Commitment” and Dr Juliette Simont (Université Libre de Bruxelles) on “L’impératif moral chez Kant et Sartre” plus sessions focusing on psychoanalysis, Marxism, Theology, Sartrean Phenomenology and the Political this two-day event in Oxford on 30-31 January is sure to have something of interest! Updated details should appear on the conference website shortly. In the meantime, you can sign-up to participate here. See you in Oxford next week!